If you’ve always wanted to learn how to make ricotta cheese, now’s your chance; all you need is milk, lemon juice, and a little vinegar. Asking for a friend, but… does anyone really know where ricotta cheese is stocked in the store? Sometimes, it seems like they move it around just to keep you on your toes. If you’ve had trouble finding ricotta cheese, too, or you’ve forgotten to buy it, the good news is that you can make your own—or a very close approximation, anyways—in minutes and with very little work. Really! 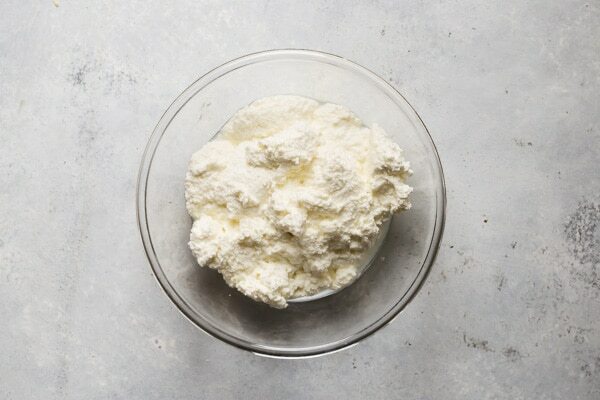 This recipe for homemade fresh ricotta cheese is absolutely perfect for lasagna, desserts— any and all recipes, sweet or savory, that call for ricotta cheese. On a more technical note, because it’s worth pointing out: authentic ricotta cheese is made from cooked whey, which is a by-product of the cheesemaking process outlined here. How ricotta cheese is made using whey will be covered here, as well, in case you’d like to hone your cheesemaking skills. However, this is a recipe for an easy milk-based ricotta, which is more like a fresh farmers cheese. It’s just as wonderful, and is a fabulous ricotta alternative. Think of it as ricotta’s understudy in the most delicious play ever. Needing a smaller amount of fresh Ricotta Cheese? Click and slide the number next to “servings” on the recipe card below to adjust the ingredients to match how many you’re feeding—the recipe does the math for you, it’s that easy. All the tools you need to become the best ricotta cheesemaker ever. These are what I use, but work with what you have. What kind of milk do you use to make ricotta cheese? The type of milk you use depends on how rich you want the end result to be. Some cooks swear by a cream and milk blend, but I find that pasteurized full-fat (vitamin D) milk works perfectly. You can make ricotta cheese with 2% milk, as well; it just won’t be as rich. Skim milk is trickier to get to separate, so maybe avoid using skim milk your first couple attempts. Some lucky ricotta makers have a reliable source for raw milk, but it’s not necessary. Goat milk works well, too! Special note: For those who want to use organic milk, please keep in mind that you cannot use ultra-high temperature (UHT) pasteurized milk, as this process changes the protein structure of the milk and prevents it from separating. Unfortunately, many organic milks are UHT pasteurized, so if you want organic, definitely check the carton of milk before buying. How much milk do I need to make ricotta? A gallon of milk dependably makes about four cups of ricotta depending on how long you let it drain. Combine the lemon juice and vinegar in the measuring cup, or in a squirt bottle, if you have it. Use fresh lemons, but not Meyer lemons, for the juice. There isn’t enough acid in the Meyer lemon juice to curdle the milk. 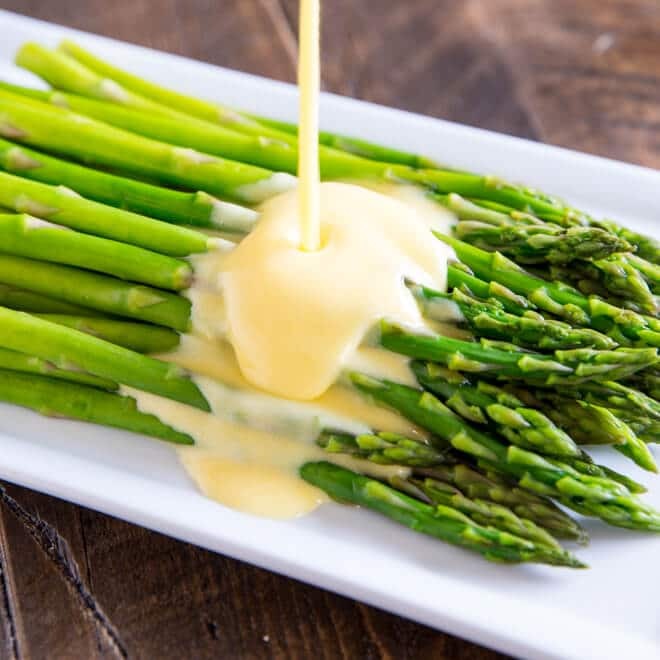 I prefer making the cheese with a combination of lemon juice and vinegar, but you don’t absolutely need both. If you don’t have lemon juice, use more vinegar. Also, if you don’t have vinegar, use more lemon juice. Gently heat the milk and salt in the saucepan to 185 degrees. 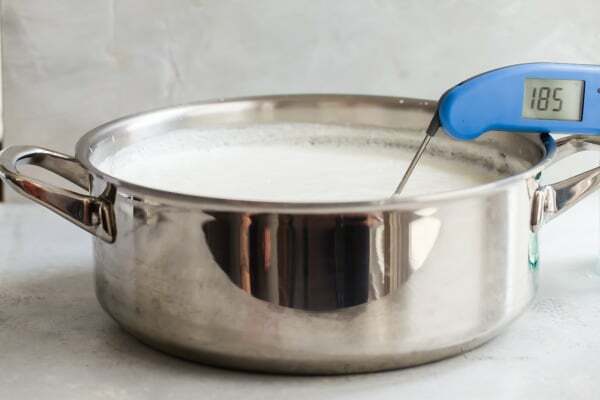 Stir with a rubber spatula to keep the milk from scorching. Turn off heat and slowly stir in the lemon juice/vinegar. Stir just until the mixture curdles. Let the milk rest, without stirring. In about 5 to 10 minutes, the mixture should separate into solid curds and translucent whey. 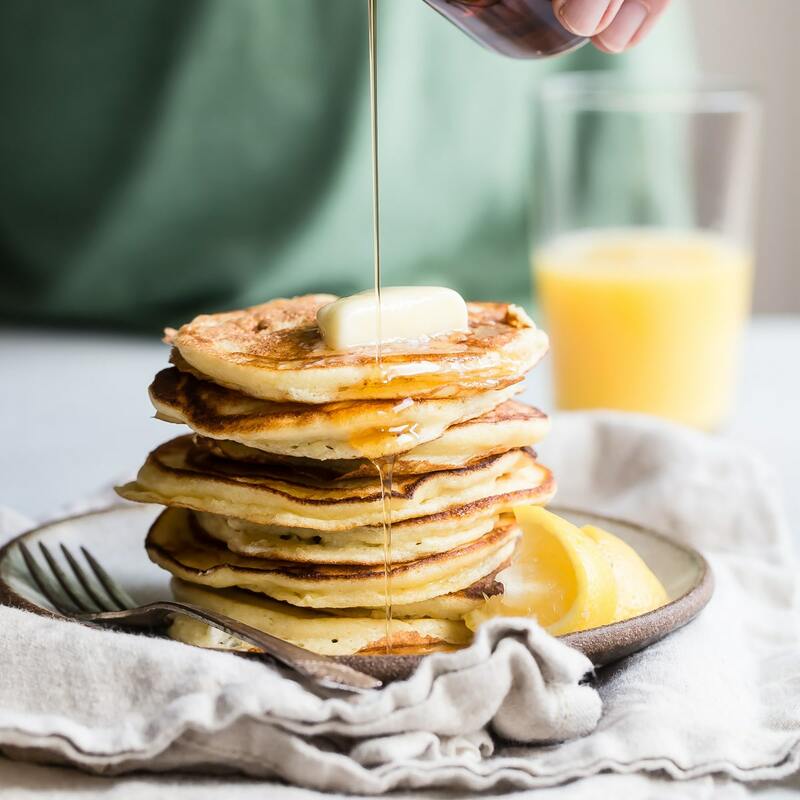 If you still see a lot of milk that hasn’t separated fully, add another tablespoon of lemon juice or vinegar and wait a few more minutes. Pour mixture into the cheesecloth-lined colander. Let the whey drain out of the cheese without disturbing it. After 8 minutes or so, the cheese should look a little dry at the edges, but very moist at the center. At this point, you can move the cheese to a bowl, and give it a gentle stir to break up the curds and reincorporate the remaining whey. 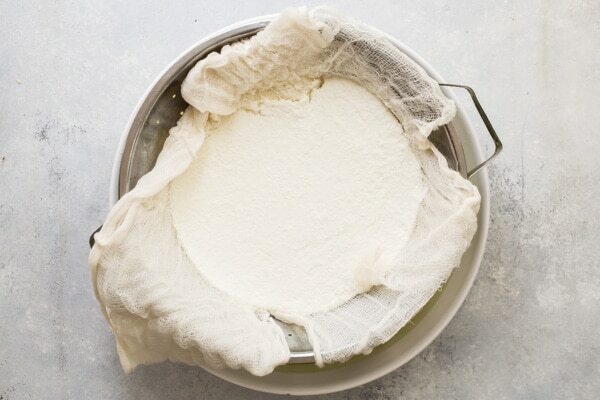 Let the ricotta drain for up to 60 minutes, depending on how wet or dry you prefer your ricotta cheese. If the cheese becomes too dry, you can also mix some of the whey back in before using or storing it. Pack it into a container, cover it and store in the refrigerator. Use it soon after making. Fresh ricotta can be used immediately or refrigerated in an airtight container for up to a week. Can you freeze ricotta? Yes, but you’re better off making it fresh when you need it. Which is easy, because now you know how! 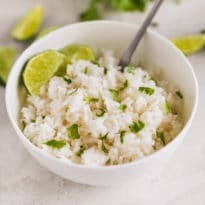 What can you do with the leftover whey? Whey is delicious in smoothies, and is perfect in place of water for bread making and pizza dough. Because whey is high in lactose, it adds sugar to the dough and feeds yeast. Less waste, happier planet. Traditional ricotta cheese is a slightly more elaborate process made by cooking whey; here it is if you want to try it. Let me know how it goes in the comments below. Collect the whey from making cheese in a non-reactive pot. Cover the whey and let it sit for at least 12 hours at room temperature to develop sufficient acidity. This acidity will act as a natural coagulant, so you won’t need to add acid. Next, heat the acidified whey in a saucepan, stirring to avoid sticking or burning. Heat until the temperature has risen to about 175 degrees and a white foam appears on the surface. Continue heating and stirring until the temperature reaches 200 degrees. 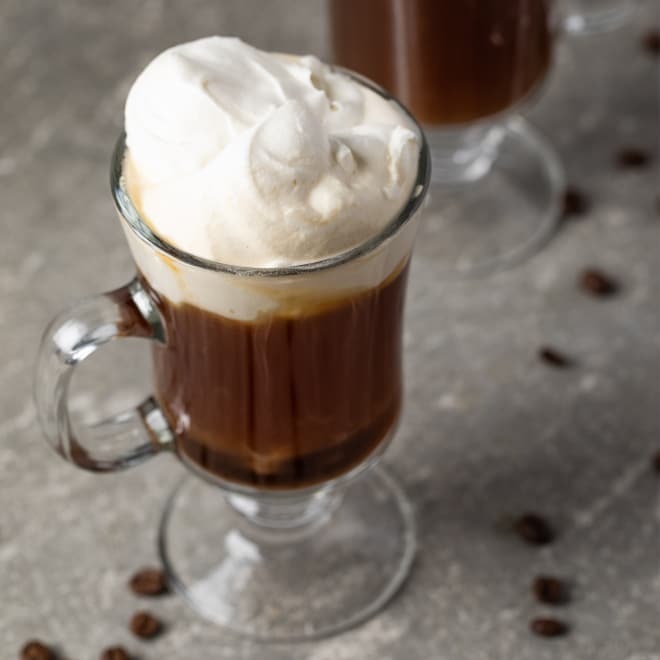 The foam will increase as it heats; be careful not to boil over. Remove the whey from heat and wait for it to curdle. Cover it and allow it to cool undisturbed until the saucepan is cool enough to touch. As it cools, curds will appear like clouds suspended in the whey; the whey will be clear and slightly yellow-green. Once cooled, it’s time to strain the ricotta. Do not stir up the curd. Instead, set up a receiving pot with a large colander or sieve and a few layers of cheese cloth on top. Pour the curds into the cloth, leaving the whey in the saucepan. Discard the whey or use it for bread making. Drain the whey through the cloth. Because of the fine nature of the curds, it can take 2-3 hours for the whey to completely drain. If you prefer, you can set the strainer in the refrigerator and let it drain overnight. 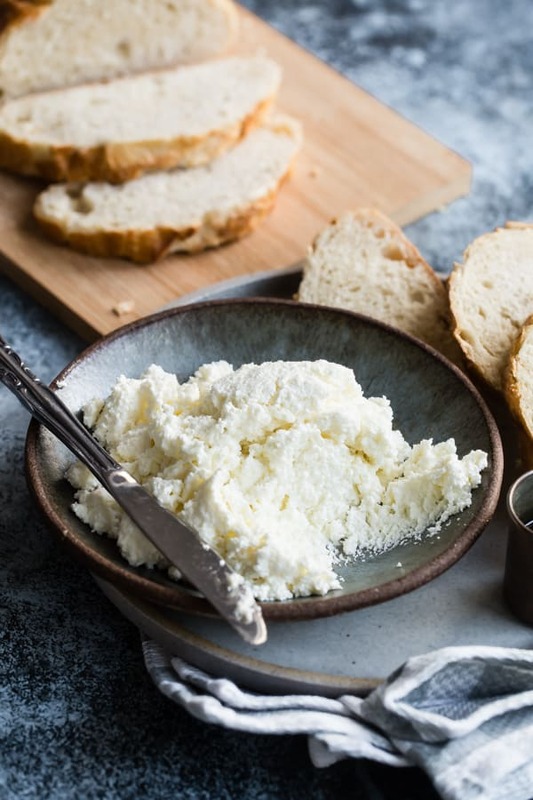 Depending on the milk you use, ricotta cheese has slightly different nutritional values. A 1-cup serving of whole milk ricotta cheese contains 428 calories and 32 grams of fat. See below for the specific details. In small amounts, ricotta cheese is healthy, especially homemade ricotta cheese. Needing some Ricotta Cheese Recipes? Just say the word! The Best Make Ahead Lasagna ever, or these divine Three Cheese Spanikopita Triangles. Ricotta cheese is to die for in my One Pot Manicotti Pasta Bake, too. Learn how to make Ricotta Cheese at home with this fool-proof tutorial. 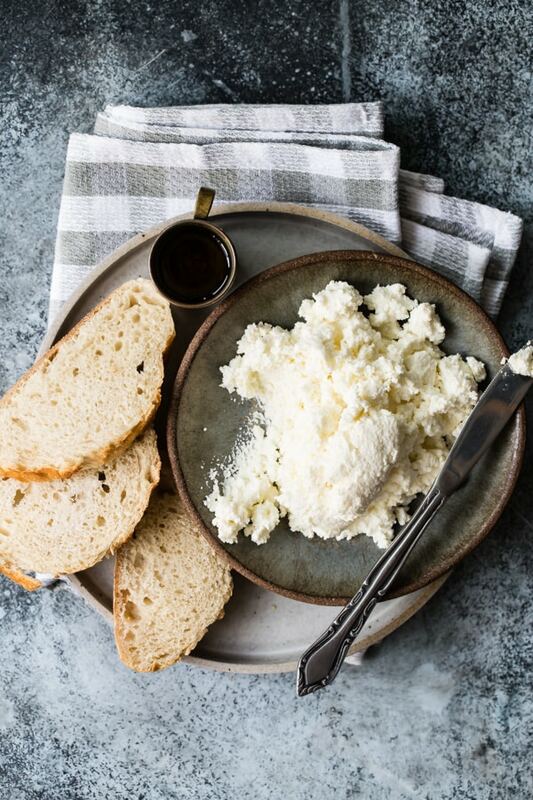 Delicate and creamy, fresh ricotta cheese is ridiculously good in pancakes, lasagna, or all by itself on bread with a drizzle of local honey. 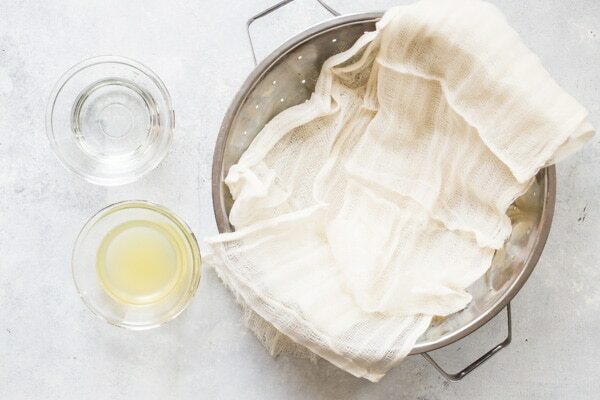 Line a colander with a triple layer of cheesecloth and set in sink. In a liquid measuring cup, combine lemon juice and vinegar. In a Dutch oven or large saucepan over medium-high heat, heat milk and salt to 185 degrees. Stir frequently with a rubber spatula to prevent scorching. Remove pot from heat and gently stir in lemon juice and vinegar until the mixture curdles, about 15 seconds. Let rest, without stirring, until the mixture fully separates into solid curds and translucent whey, 5 to 10 minutes. 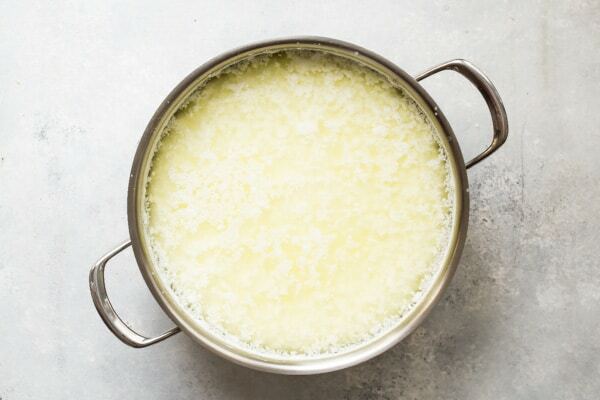 If curds do not fully separate the whey looks milky, stir in 1 tablespoon of vinegar and let sit 2 to 3 minutes longer. Repeat this process until curds separate. Gently pour prepared mixture into prepared colander. Let rest, without moving, until whey has drained from edges of cheese but center is still very moist, about 8 minutes. Gently transfer cheese to large bowl, keeping as much whey in center of cheese as possible. Stir well to break up large curds and incorporate whey. Refrigerate until cold, about 2 hours, or up to 5 days. Stir ricotta before using. I’m going to try this today, we have to make a dish for my daughters cooking class. We are making homemade manicotti. 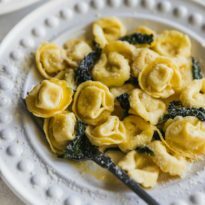 Question, the part above about making ricotta from whey. Is this the leftover whey from the first ricotta process?